Whether it's for their daily commute or an epic road trip vacation, most people get behind the wheel hoping that their fellow motorists will be cautious and courteous drivers. Unfortunately, information from the National Highway Traffic Safety Administration (NHTSA) shows that isn't quite the case. NHTSA statistics reveal an alarming rise in aggressive driving behaviors and identify aggressive driving as a contributing factor in as many as two-thirds of all traffic accidents involving fatalities. Learning to spot aggressive driving behaviors can help you protect yourself and your family on the road. If you or someone you love suffered injuries in an accident that was caused by another driver's aggressive driving tactics, it's important to understand and explore your legal options. You may be entitled to pursue compensation for medical bills related to the accident, as well as property damage to your vehicle and lost wages if your injuries render you unable to work. 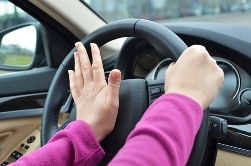 Can You Recognize Aggressive Driving? Some drivers may not consider these or other aggressive driving behaviors to be particularly dangerous when they engage in them. Yet, according to research conducted by the U.S. Department of Transportation's Federal Highway Administration's (FHWA) Smooth Operator program, drivers identified aggressive driving as one of the greatest threats on the road—and even more worrisome than drunk driving. Research shows that the majority of aggressive drivers involved in fatal accidents tend to be young, white men between the ages of 18 and 30. However, anyone who allows situational stressors—a long, taxing commute or running late for an important meeting—to affect the safety of their driving can be an aggressive driver. Personality traits can also play a role. According to the available data, aggressive drivers are more likely to have anti-social or competitive personalities that cause them to be overly impulsive or overestimate their driving abilities. There are a number of law enforcement agencies that coordinate their efforts and provide programs to prevent and reduce aggressive driving. One such program is the Smooth Operator program, which supports awareness campaigns to alert the general public to the dangers of aggressive driving. The Smooth Operator program also promotes the vigorous enforcement of driving law, conducts research into driving behaviors, and proposes possible solutions. If you were injured in a car accident that was caused by another driver's aggressive behavior on the road, you may find yourself dealing with a number of unforeseen financial challenges. Fortunately, you may not have to bear these burdens unassisted. Contact the experienced personal injury attorneys at the Inland Empire Law Group today for a free review of your case. We can help you understand your legal options and if you're entitled to pursue compensation for your injuries. Is Texting and Driving That Bad?